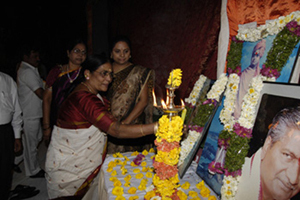 Hindu College for Women was established in the year 1997 with affiliation from Osmania University by Swamy Vivekananda Seva Samithi Education Trust under the dynamic leadership of a well known social worker, Philanthropist Shanti duta Late Kanjerla Shanker Yadav, with divine blessings of his holiness Sri Sri Sri Jayendra Saraswathi Swamy of Kanchi. 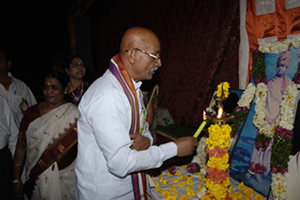 The management promote the value education with the emphasis on Nationalism secular integration and emphasizing on the glorious Indian Heritage and culture and imparting quality education on non-profit basis with a motive of providing education to women. They believe in the saying that “If a woman is educated, one generation is educated”. This belief and determination to serve women society made the college evolve into a complete one with all possible conventional and novel courses, added year after year at undergraduate and postgraduate levels. Ever since its perception the college has the distinction of excelling in academics and extracurricular activities. It always stood ahead in promoting the job oriented quality education to the women in tune with the changing scenario to compete with their counterparts in all spheres. The students to apply the knowledge on contemporary issues with compassion and love. Cultivate the skills, attitudes and habits of life long learning. Accord priority to vocational and enterprising education. Develop a sense of responsibility and cooperation. Provide opportunity to develop individual talents and interests. Create awareness in cybernetics and mass media. To promote diverse skills of the students by facilitating co-curricular and extracurricular support. Instill human values and promote harmonious interpersonal relationships. Respect and care for the environment.